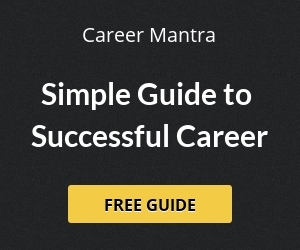 Uttarakhand Public Service Commission UKPSC has released notification for the recruitment at 14 posts of Assistant Accountant and 01 posts of Junior Auditor in Group C (Samuh G) category in Uttarakhand Excise Department. 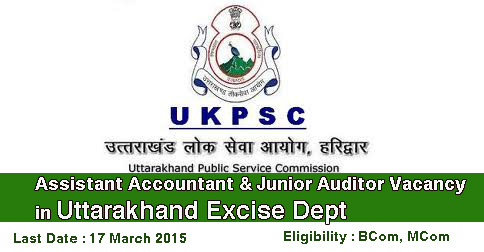 UKPSC invites online application for the Assistant Accountant and Junior Auditor Exam 2014 for its Group C posts till 17 March 2015. Interested candidates can apply online on UKPSC official website www.ukpsc.gov.in . Application fee to be submitted in SBI bank after 2 days of online submission. Candidates have to send the printout of the online application, self attested copies of documents/ testimonial and copy of fee challan to UKPSC, Gurukul Kangri, Haridwar – 249404 till 30 March 2015. Help us to improve this article/job posting "Assistant Accountant & Junior Auditor Vacancy in Uttarakhand Excise Dept". We would be glad if you can comment below and provide your valuable suggestions and feedback. If this page have any wrong information/list or out of context content, then you can report us as well. I am Presently Working Sardana’ Art Centre Pvt. Ltd. Tilak Nagar , New Delhi – 110018. Is the exam date gone? There is no option to download the admit card in upksc website. Please sumbody letme know if the exam date is already gone..
i have sumit my application for uttrakhand publiccommission excise dept. exam 2014 but not get any intimation of exam. Pls confirm the mains exam date, till today we don’t have receive any information related to mains exam of ukpsc excise deptt 2014 asstt accountant & junior auditor, like exam centre and timing.